You have some day-old bread (maybe several days), don’t fret, make some bread crumbs! Seriously, this is so much better for cutlets, schnitzel or anything that uses bread crumbs. We’ve used this for chicken breasts and even as a topping for a seafood pasta! 1. Use a food-processor to make crumbs from the bread. 2. Mix crumbs, grated cheese, parsley, salt and pepper together. 3. In a large flat frying pan set to medium heat, heat olive oil and sauté the garlic and onion until garlic begins to turn golden and onion translucent. 4. Add the butter, allow butter to melt and coats evenly. 5. 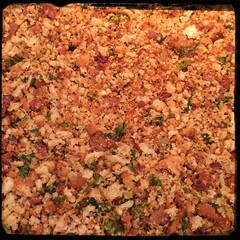 Add breadcrumb mixture and let toast mixing constantly, you may want to add more olive oil. 7. Remove from heat, store in fridge.